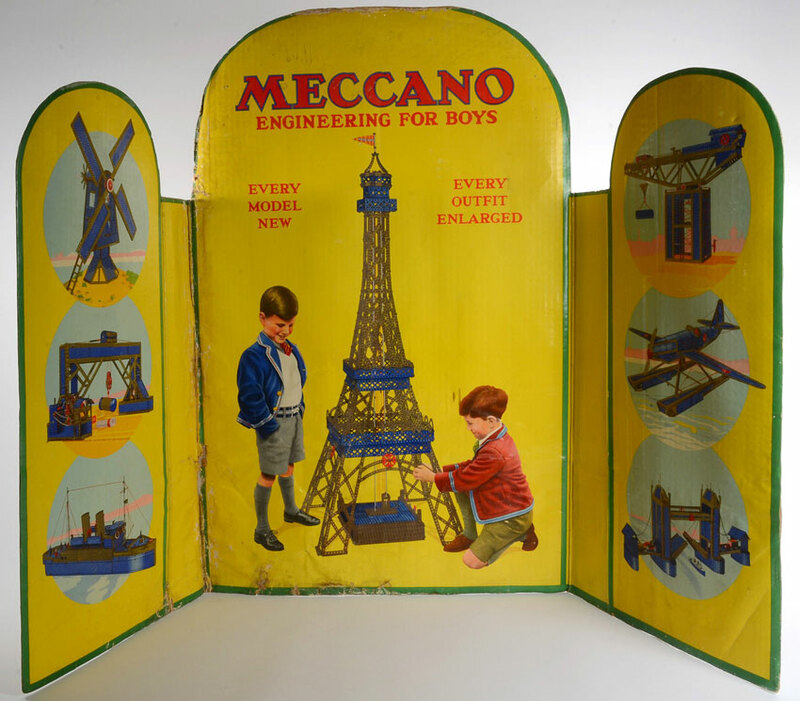 In november 1934 over eighty years ago an advertisement in the Meccano Magazine (Shown below) announced "Boys! Here's good News!" 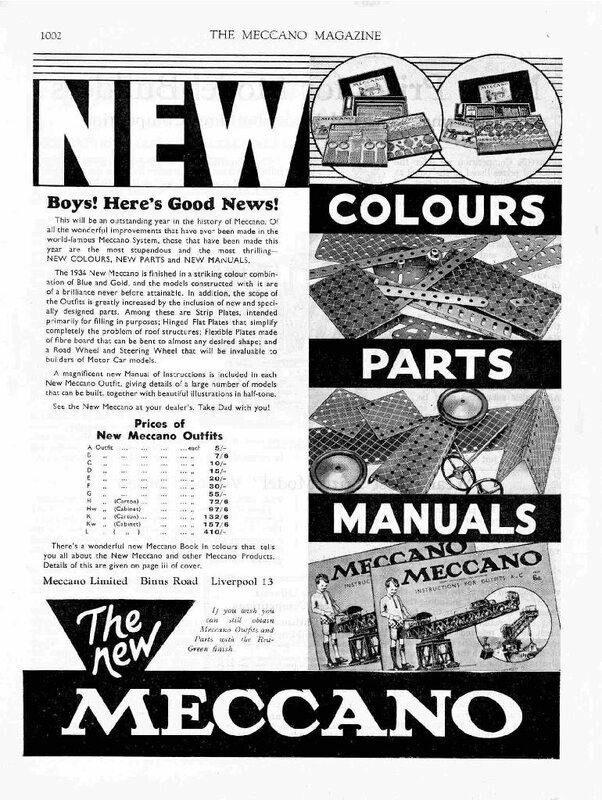 the NEW Meccano, new colours, parts and manuals. 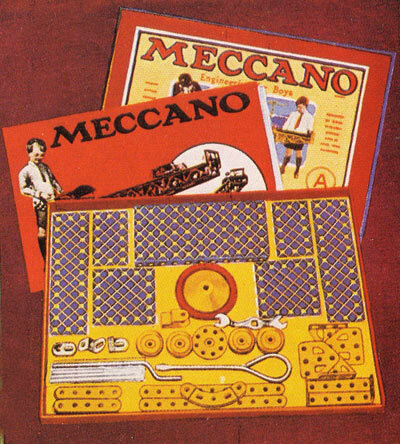 It was a pity the ad was not in colour as the back cover, reserved for Meccano products always featured colour. Perhaps there were doubts about the monumental change and its impact would be less in black and white! 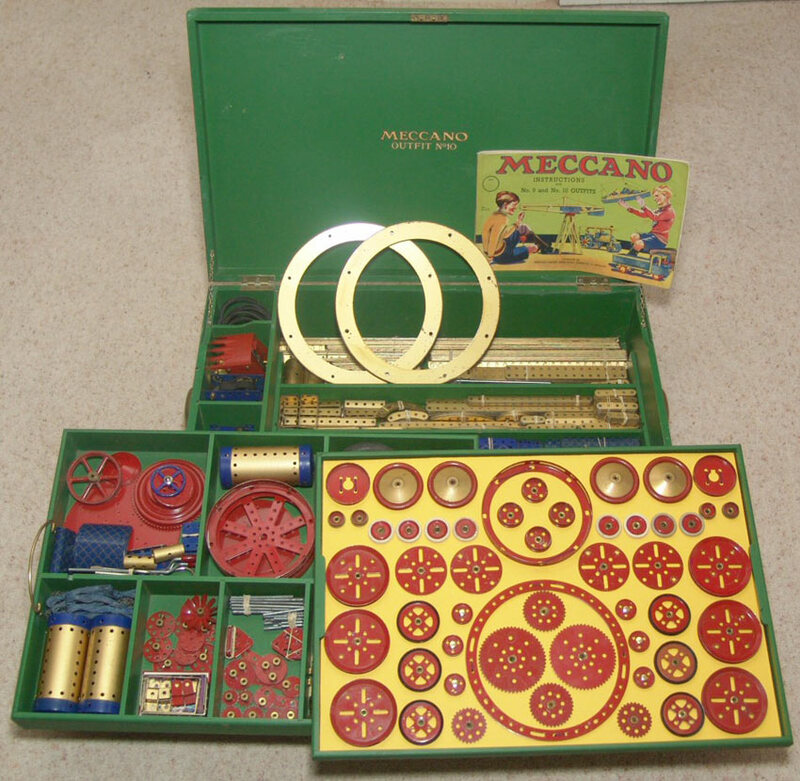 It was not good news for the many boys who already owned red and green parts but as a concession it was stated in the small print, that sets and parts in the old colours could still be obtained, although the sets available in the UK were only the 000 and 00 the smallest in the range. 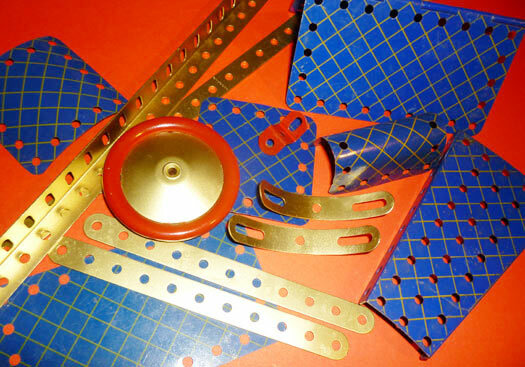 Sets exported to Australia Canada and other countries had parts in red and green and only the flexible and strip plates in the cross hatched blue. It is thought that the Blue and Gold colours were chosen in celebration of the Silver Jubilee of King George V the following year, this might well be the case as Frank Hornby was a great patriot. During the first three years of the blue gold period the lettered series, the smaller sets A- E featured new models showing extensive use of the new strip and flexible plates some models were the same with plates replacing the braced girders. In the larger sets F - L, models were nearly all adaptations of earlier models or the same models with the illustrations retouched to show the cross hatching and in some cases the printing blocks were altered. The lack of new ideas was a pity as the full potential of the new parts was not realised until the sets were revised in 1937. In 1937 the range of sets was changed, this time to a more sensible and understandable numerical system 0 -10. The new sets had a less parts, especially the large sets, than their equivalent sets in the A-L. range. The new content and set numbers did mean that all the Manuals had to be redesigned with almost all containing many new models. 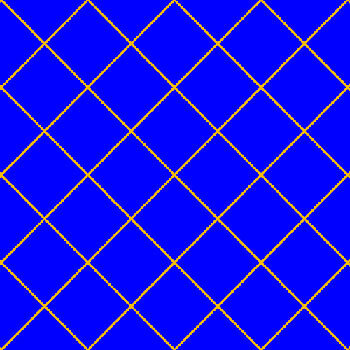 Changes were also made to the colour of some parts. bush wheels, wheel discs, one inch pulleys, flanged wheels and a few small parts were sprayed red. The strip and flexible plates had rounded corners instead of the previous square, sharp ones. The road wheels came with red centres and white rims, a new part the semi circular plate was also introduced at this time . Although sets around 1937 can have different combinations of these colours, my original 5, 5a and 6a sets had both types of plates red and gold road wheels all brass wheels (none red) but with red, double angle brackets. Shown below is one of the two attractive small parts boxes I recently obtained from the 7a Accessory set. 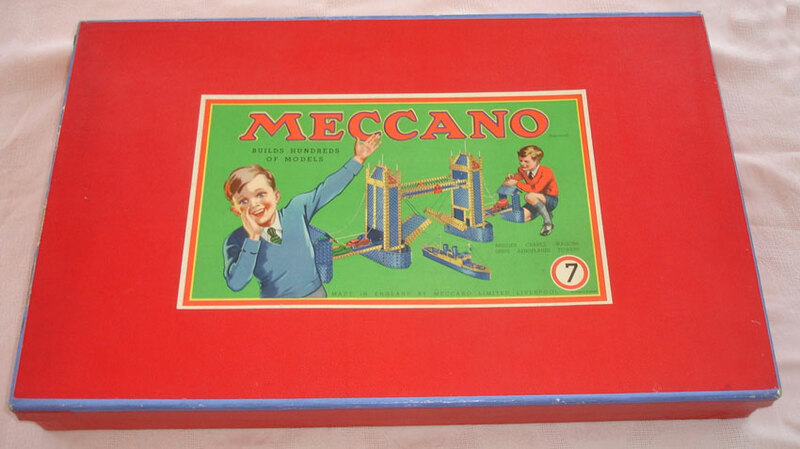 Meccano in France continued with the blue and gold colours until 1970. The number 7 outfit with the lid closed. 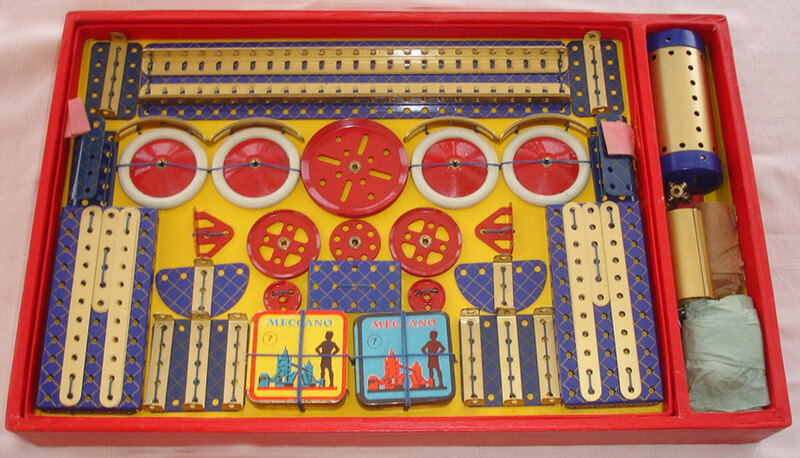 Note the two Meccano models are completely out of scale. What you saw when you removed the lid, a joy to any boy in 1940 and to any nostalgic adults today. 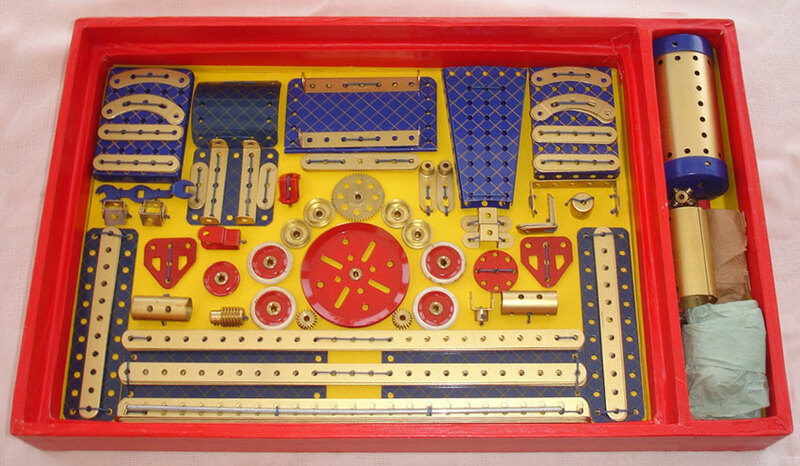 The number 7 outfit with the top tray removed. Shown above is a near perfect No. 10 set from the year 1938, the set is displayed in the picture just as it was shown in the 1938 catalogue, the presentation certainly has the Wow! factor (picture by kind permission of Charles Steadman). A very rare dealer window display board probably dating from 1937 when the sets were revised. This was sold on eBay in 2017.